Lake Willoughby located just about 15 minutes from Burke is a summer haven for fishing, boating, and swimming. But come wintertime, the cliffs of Mt. Pisgah above this glacial lake are draped with ice. 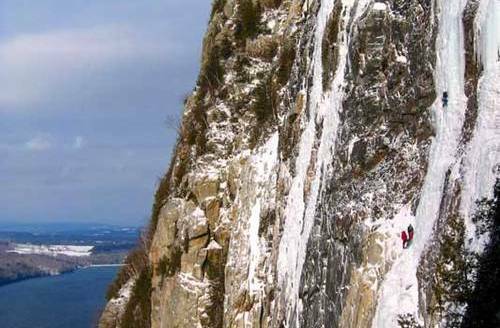 For adventure seekers looking for some serious ice climbing and absolutely stunning views, Mt. Pisgah is your mountain. Definitely not for beginners, but if you're experienced or come with a guide, you're in for an amazing experience! Kingdom Adventures Mountain Guides (KAMG) provides instruction in rock and ice climbing, mountaineering, avalanche education, and wilderness first aid training. International trekking opportunities are also available in partnership with other guide services.